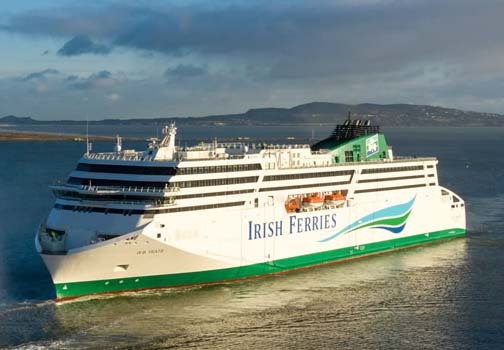 W.B Yeats is the latest vessel to be added to the Irish Ferries fleet. 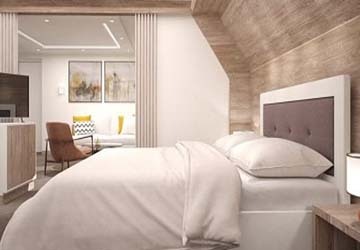 This brand new luxurious cruise ferry will help you cross the Irish Sea in comfort and style. 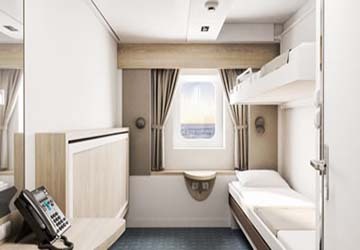 On board you’ll be spoilt for choice with amenities, lounges and ways to keep yourself entertained. 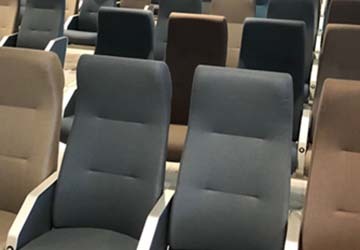 Each passenger can enjoy access to free Wi-Fi, a cinema, there’s a designated children’s area and a fantastic outer deck space. 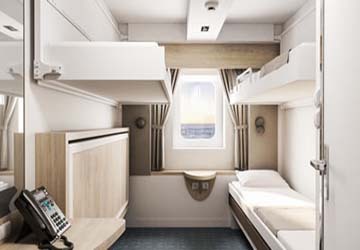 If you want to book a cabin for your trip, there is something to suits all travellers needs and budgets. 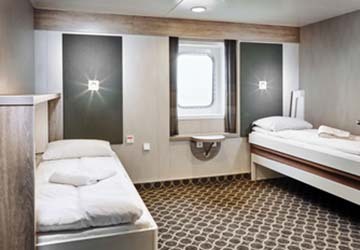 There is an extensive range of cabin options aboard this state of the art ship. From Premium Suites with a private balcony to four bed bunk rooms, whatever your preference or budget, there is bound to be an choice to suit you. Outside of the cabins you’ll find an array of areas to sit back, relax and unwind. 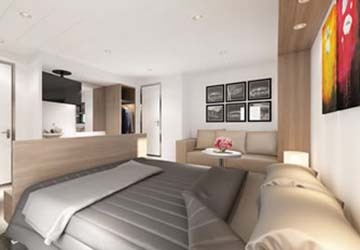 If a tranquil travelling experience is what you’re after, The Hazel Wood Quiet Lounge provides peaceful surroundings whilst completing your sailing. There are other lounges available and a great range of seating options throughout the public deck areas. Whether you’re after a light bite, a little snack or a hearty hot meal, there will be something just for you. With Boylan's Brasserie, Café Lafayette, Lady Gregory A la Carte Restaurant and barista style coffee available, there is everything from casual dining, self service buffets and full service restaurants for you to choose from. Need some souvenirs, travel necessities or just fancy treating yourself? You’ll find deals on fragrances, fashion, holiday essentials and a variety of gifts in the onboard shopping facilities. There is no need to just enjoy the magnificent sea vistas from behind a glass window. Get out on the Drumcliffe Promenade Deck and take in the fresh sea air. Back inside you can chill out with a movie in the cinema lounges. 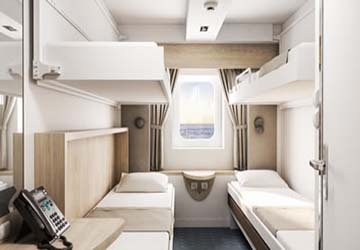 As well as the outside deck, cinema and free Wi-Fi there are kid specific options to help keep the little voyagers entertained throughout. The Salley Gardens Kids Room and Crazy Jane's Games Room are the ideal place for younger travellers to burn some energy and pass the time. Please Note: Whilst we have taken great care in making our W.B. Yeats guide as accurate as possible, onboard facilities, services and entertainment may vary depending on the date and time of year that you travel, facilities mentioned may change without notification and ferry companies reserve the right to operate vessels other than those mentioned at time of booking without prior notification.